Serendipity is a funny thing. I turned on the Today Programme this to hear a discussion about a “Miss Myers”. My ears of course pricked up. It turned out however that they were actually talking about a Miss Vivian Maier (the pronunciation is exactly the same), a street photographer who was discovered after her death in 2009 when a man named John Maloof purchased a box containing rolls and rolls of her film at a thrift auction. On closer examination these film rolls revealed over 100,000 images of street life in New York and Chicago from the 1950s through to the late 1990′s, taking in all walks of life but focusing particularly on the poor and outsiders. I must say that when I visited the Vivian Maier Collection website I got rather distracted from doing the accounts. Miss Maier’s photography quite stopped me in my tracks. Her images capture fragments of the every day, moments that would have gone quite unremarked, that would have been quite forgotten, that tell us so much about an individual, a life, a moment in place and time and which also leave us tantalised with so many questions. The incidental, the spontaneous, the small insignificances of life speak volumes through her lens and there is in my opinion something both beautiful and poignant in that. So a case of double serendipity. Serendipity that this talented photographer got discovered at all by Mr Maloof and serendipity that turning on the radio at the exact moment to hear my name means I am sharing my excited discovery of Miss Maiers with you today. I can only share with you here an image of the exhibition poster, as getting permission to use the actual photographs on the blog is all rather complicated. 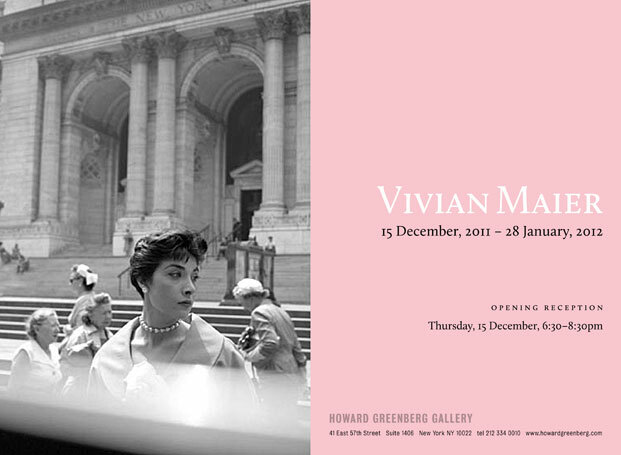 However you can explore her extensive and fascinating portfolios on the Vivian Maier Collection website. This entry was posted in Uncategorized on September 10, 2014 by Miss Myers.